The PCB-841SWL is a solution to a long, hugely unsolved problem. Any caregiver can tell you how difficult it can be to make a safe transfer from walker to chair, to a stationary chair positioned at a table, or within a small area. Thanks to this exceptional innovation, those problems are solved. 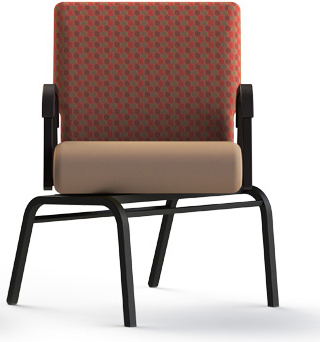 The PCB-841 Swivel allows clients and caregivers alike, the ability to swivel the upper portion of the chair into position while leaving the chair's base safely stationary. The chair is fantastic for dining areas, but it has many other applications like workstations, or anywhere a stationary, swiveling chair would be helpful! Quick Ship in Root Beer Vinyl Seat and back in 24-48 hours. Ships in 12-business days or less for all other upholstery! Makes forward/back Gliding a breeze!